And the Award Goes to… the City of Dover! 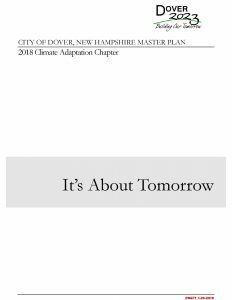 At this year’s spring conference, members of the New Hampshire Planners Association (NHPA) presented the City of Dover with the 2018 Plan of the Year award for the city’s recently adopted climate adaptation chapter of its master plan. This accomplishment follows on the heels of the 2017 Climate in the Seacoast (C-RiSe) vulnerability assessment, which identified inland coastal portions of the city that were most susceptible to flooding from future sea level rise. 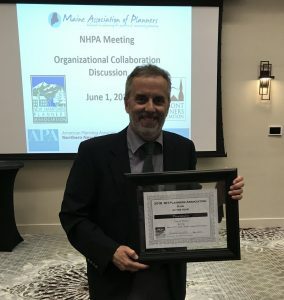 The master plan chapter is the first of its kind in New Hampshire, and the award is the second NHPA Plan of the Year award Dover has received in the past three years; the 2016 Downtown Pedestrian and Vehicular Access Study was the first. Appropriately titled “Planning for a Resilient Tomorrow,” the chapter goes well beyond standard master plan chapters in attempting to address an inclusive set of local planning challenges associated with climate change. According to a press release from the city, the chapter “examines climate change in a comprehensive manner and is designed to inform future land use decisions and identify public and private risk and vulnerability.” The chapter covers issues pertaining to water availability and quality, health and safety, food, energy, infrastructure, and natural resources. It was carefully prepared using existing condition data and the best available climate change science. The chapter was unanimously adopted by the Planning Board at the conclusion of a public hearing on Feb. 27, the culmination of nearly a year-long effort. The chapter’s development followed a collaborative and transparent approach between an appointed master plan steering committee and staff from the city, augmented by consulting services provided by the Strafford Regional Planning Commission, UNH Cooperative Extension, and NH Sea Grant. The steering committee was made up of members of the public as well as the planning board, city council, open lands committee, conservation commission, and energy commission. To encourage public participation, the city ensured all steering committee meetings were open to residents, hosted a workshop on the draft actions, and disseminated an online survey, which received over 150 responses. The result was a chapter that outlines 47 action items to be carried out over the next ten years. The actions are grouped into four categories: outreach and engagement; studies and initiatives; operations, policies, and procedures; and regulations. A table in the chapter shows the primary climate topic each action is associated with, the interplay and overlap with other climate topics, the priority ranking, responsible party, and chapter reference where readers can find more information and details about that action. The climate adaptation chapter is posted on the city’s master plan web page. Hard copies are available in the planning department located in Dover City Hall and at the public library. Funding for the chapter was provided by the National Oceanic and Atmospheric Administration’s Office for Coastal Management under the Coastal Zone Management Act, in conjunction with the New Hampshire Department of Environmental Services Coastal Program, as part of the NH Setting SAIL Project. For more information, contact the Department of Planning and Community Development at 603-516-6008.